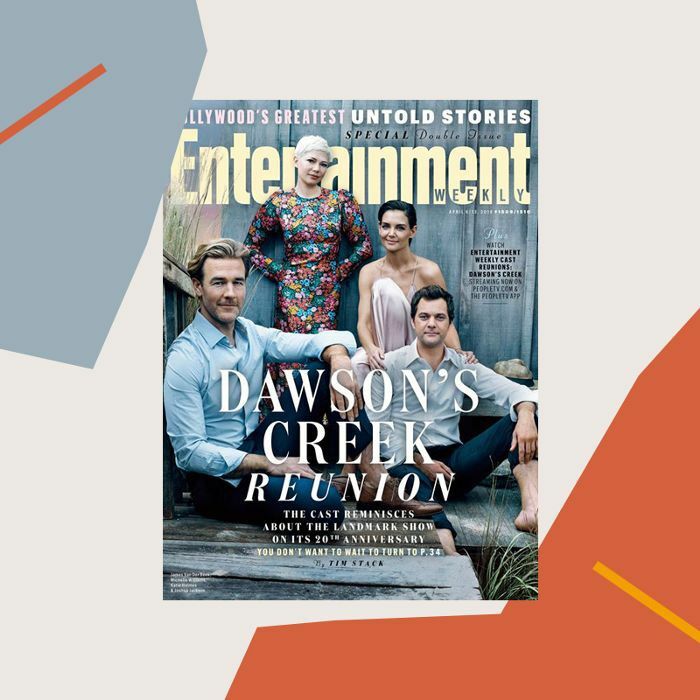 It's been 20 years since the iconic teen drama Dawson's Creek graced The WB airwaves, and Entertainment Weekly understands the gravity of this monumental event. The magazine corralled members of the original cast back together for an exclusive reunion photo shoot, and our teenage selves couldn't be happier. The shoot includes the primary cover shot, featuring Katie Holmes (Joey Potter), Joshua Jackson (Pacey Witter), Michelle Williams (Jen Lindley), and James Van Der Beek (Dawson Leery), plus four solo portrait-style covers of Holmes, Jackson, Van Der Beek, and Michelle Williams, who shared her shot with her BFF, Busy Phillips (Audrey Liddell). Additionally, the magazine conducted exclusive interviews with Holmes, Jackson, Van Der Beek, and Williams (don't miss the moment in the video where Joshua Jackson gently lays his head on Katie Holmes' shoulder, and Pacey & Joey fans everywhere swooned) and reunited them with fellow cast members Meredith Monroe (Andie McPhee), Mary Beth Peil (Evelyn "Grams" Ryan, looking like the most glam version of Gram we could ever imagine), John Wesley Shipp (Mitch Leery), Kerr Smith (Jack McPhee) and more. Head over to Entertainment Weekly for more.